Our obsession to pursue perfection is visible in every shutter that ships from our facility. The Kirtz® Shutter is meticulously handcrafted with care and attention paid to every detail. Our experienced artisans are passionate about working with beautiful woods, and take great pride in knowing these shutters will be enjoyed and appreciated by our customers for many years to come. In today’s world of automated manufacturing, isn’t it refreshing to find a company like Kirtz, where one still appreciates a craftsman’s skillful hands? Kirtz in-house milling also allows an advanced degree of customization in your shutter and framing profiles. 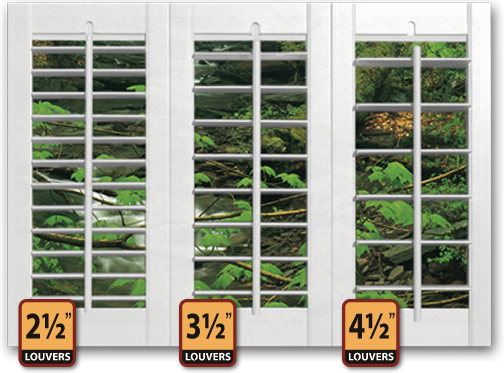 Examples of customization include shutter panel thickness, stile width, and louver size or orientation. If our standard options don’t meet your needs, custom framing profiles can be designed to match the millwork in your space. Kirtz® Shutters are available in three louver sizes, offering flexibility when it comes to balancing interior décor with your view of the world around you. Notice how larger louvers help maximize your view. The image on the right illustrates how your view will change depending on which louver size you choose. The custom process doesn’t end with shutter design and construction, but includes the finishing of your shutters. From custom paint and stain matches, to specialty finishes such as glazing, antiquing and distressing, the design possibilities with Kirtz Shutters are endless. Each custom shutter from Kirtz Shutters is given a furniture quality finish. Finish options begin with our standard paint and stain colors. However, many of our clients prefer to use our custom color and finish matching service. Custom color finishes are made to order at Kirtz Shutters. Each color is matched, not by machine, but by a Kirtz finish specialist. The color match is then viewed under a myriad of lighting conditions to make certain it will be acceptable in any lighting environment. After the color is matched to our specialist’s satisfaction, a physical sample is sent to the client for approval. Upon approval, the custom shutter order is ready for production. 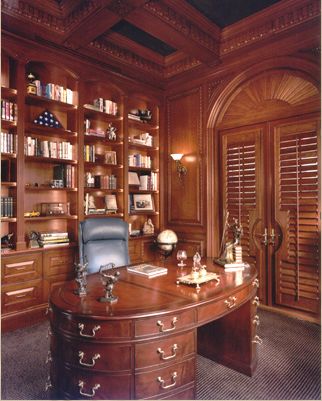 Kirtz offers custom crafted specialty finishes for clients who desire the extraordinary in their plantation shutters. Our specialty finish work includes glazed shutters, distressed shutters, and antiqued shutters. Choose from our library of finish techniques, and personalize it with your color choices, or let our artisans create a unique look just for you. If you have a highly custom project, or are simply looking for a premium quality, beautiful custom plantation shutters, call us today at 800-416-6455 to find out how Kirtz can help with your shutter project.